Leon Bennett/WireImage The sport's most important number? Sixty-four. Because the NBA's 64th season is finally underway. 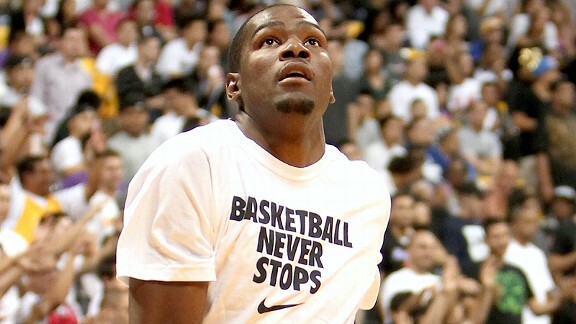 It maybe wasn't the snappiest slogan, but it definitely applies to what we're about to get into here: Basketball Never Stops. The numbers just kept piling up, too, even when the NBA shut down for five months. Our annual Year in Numbers review should slam that point home, with what must be our most voluminous compilation yet to A) thoroughly recap the year that was and B) properly launch another season of Weekend Dimes. The Mavericks were on a 63-win pace when the ball was thrown up on the first night of 2011, only to see Wisconsin native Caron Butler suffer a season-ending knee injury in front of family and friends in Milwaukee ... with Dirk Nowitzki already in the midst of a nine-game injury absence during which Dallas would go 2-7. Butler's Jan. 1 misfortune was widely presumed to signal the end of the Mavs' title hopes. The value of the New York Knicks, according to Forbes, had skyrocketed to $655 million by the end of January, up 12 percent from $586 million and taking the Knicks past the Los Angeles Lakers as the NBA's most valuable franchise. The rise was attributed to increased ticket sales and sponsorships at Madison Square Garden, even before Carmelo Anthony would arrive at Madison Square Garden to join Amare Stoudemire. Foreshadowing the sort of surprise-filled month February would be, Jazz coach Jerry Sloan abruptly halted his Hall of Fame coaching career after a Feb. 9 tiff with Deron Williams at halftime of a home loss to Chicago. Sloan reacted angrily when Williams called a play on the floor that differed from his sideline call and, after weeks of mounting fatigue and frustration with the job in general, announced that he was walking away after nearly 23 years in charge. Jazz officials tried to talk Sloan out of it, but the 68-year-old wouldn't budge, leaving the bench as the third-winningest coach of all time (1,221 wins) behind Don Nelson (1,335) and Lenny Wilkens (1,332). Sloan's longtime aide, Phil Johnson, resigned as well, resulting in Tyrone Corbin's promotion to head coach and nudging San Antonio's Gregg Popovich (Dec. 10, 1996) to the top of the NBA's longest-tenured coach list. With Reggie Miller calling the game courtside for TNT, Boston's Ray Allen sank his 2,561st career 3-pointer against the Lakers, passing Miller for the all-time lead with a right-wing triple that the two sharpshooters celebrated together at the broadcast table with a warm hug. The Grizzlies were 31-26 -- with zero playoff wins in franchise history -- when Rudy Gay was lost for the season Feb. 21 thanks to a partially dislocated shoulder. But they finished 46-36 without Gay, weathered repeated suggestions that they intentionally tried to finish eighth in the West to ensure that they drew top-seeded San Antonio in the first round, then took advantage of Manu Ginobili's own health limitations and the Spurs' lack of dependable size beyond Tim Duncan to stun the four-time champs in six games. In one of the wildest 48-hour stretches in the history of the trade deadline, New York finally brought an end to the five-month saga surrounding Anthony's future by completing a three-team deal with Minnesota to land Melo (along with Chauncey Billups) with the Knicks as he wanted all along ... followed up by the Nets rebounding from the disappointment of losing out in the Melo Sweepstakes faster than anyone imagined. Using the same trade assets it had been offering Denver since September, New Jersey swung a deal the very next morning with the Jazz for the disgruntled D-Will. The Knicks won biggest, since Anthony agreed to a long-term extension as part of the trade, but the D-Will deal will be remembered as the first big score of the Mikhail Prokhorov era for the Brooklyn-bound Nets. As long as they can convince D-Will to stay beyond this season. On the day after the trade deadline, five Pistons missed the morning shootaround in Philadelphia entirely and two others arrived late in an apparent protest against unpopular coach John Kuester after Detroit made no big moves. With Kuester playing only six players, Detroit was predictably routed, but not before Kuester got ejected for arguing a call in the second quarter. Of the five no-shows, only Tayshaun Prince and Ben Wallace are still Pistons; Rip Hamilton, Tracy McGrady and Chris Wilcox have all moved on (to the Bulls, Hawks and Celtics, respectively). Ditto for Kuester, who was fired shortly after new owner Tom Gores assumed operating control of the team in June and has since joined Mike Brown's staff with the Lakers as an assistant. Dwight Howard rung up a league-leading 18 technical fouls during the regular season, resulting in two one-game suspensions. Things didn't get much better in the playoffs for Howard and the Magic, who were upset in the first round by Dwight's hometown Atlanta Hawks. After blowing a 23-point lead on the road in Game 4 of its first-round series with Portland -- and spawning countless "same old Mavericks" rants and jokes -- Dallas went 14-3 for the rest of the playoffs, starting that run with a Game 6 closeout win on the Blazers' floor and a hard-to-fathom sweep of the defending champs from L.A.
After going 62-20 to tie Paul Westphal (Phoenix 1992-93) for the most wins for a rookie coach, Chicago's Tom Thibodeau emerged as the NBA Coach of the Year. Thibodeau's franchise player, meanwhile, would emerge as the youngest Most Valuable Player in NBA history just two days later. At just 22, Derrick Rose joined Michael Jordan in the pantheon of MVP Bulls on May 3, having powered Chicago to the top seed in the East despite lengthy injury absences during the regular season for both Joakim Noah and Carlos Boozer. Phil Jackson came back for one more season at age 65 because the Lakers were in pursuit of a three-peat and because Jackson was actually chasing the fourth three-peat of his unrivaled career with Chicago and L.A. Jackson's creaky, cranky Lakers were instead chased out of the second round in a stunning 4-0 brooming by the Mavs, but the Zen Master could console himself with the knowledge that no one in North American team sports can match his 11 championship rings. If you really believe he's done coaching. It was assumed for much of the season that Celtics coach Doc Rivers was as likely to leave his storied franchise behind just like Phil, but Boston's grave disappointment in the wake of a second-round exit to Miami was softened considerably by the surprising news that Rivers would be signing an unexpected five-year, $35 million extension. Exactly 704 days after the Minnesota Timberwolves drafted him, Spanish guard Ricky Rubio signed a two-year, $7.2 million deal with the Wolves on May 30 to ensure that -- lockout willing -- he'd be in the NBA for the 2011-12 season. A 105-95 win in Game 6 of the NBA Finals secured the first championship in Mavericks history, avenged Dallas' bitter six-game collapse against the Heat in 2006 and gave Dirk Nowitzki, Jason Kidd and Mavs owner Mark Cuban ammunition to last a lifetime to fire back at their legions of critics. In the first NBA Finals since 1994 in which neither team won a game by a margin of more than 10 points, Dallas' basketball team found out how it felt to be America's Team for a few weeks. LeBron James' scoring average dropped 8.9 points from the regular season (26.7) to the Finals (17.8), representing the largest such dip in league history for a 25 points-per-game scorer, eclipsing Wilt Chamberlain's 7.7-point drop-off from the 1963-64 regular season to the '64 Finals. In six fourth quarters in the Finals, with fans just about everywhere outside of Miami reveling in every misstep, James scored a whopping 18 points. Total. and as the unquestioned best center of his generation. Just more than a month later, after a mere eight seasons thanks to a ceaseless string of foot problems, Yao Ming followed Shaq into retirement in early July at the age of 30. The Hall of Fame might still beckon because of Yao's ambassadorial standing around the world after Houston imported him from China as the No. 1 overall pick in the 2002 NBA draft, but frustration can't even begin to describe what the 7-foot-6 groundbreaker has been coping with after injuries limited him to five games over the past two seasons. The real action, in terms of NBA players heading overseas during the lockout, could be found in China. Despite the fact Chinese Basketball Association officials refused to let their teams grant in-season out clauses to any players signed from the NBA and restricted teams to signing NBA free agents, three Denver Nuggets made the leap -- Wilson Chandler, J.R. Smith and Kenyon Martin -- along with Phoenix Suns restricted free agent Aaron Brooks. Martin is already back in the States after negotiating a buyout with the Xinjiang Flying Tigers, but all four will have to wait until the end of the Chinese season in March before they can secure the needed FIBA letter of clearance from their current employers to return to the NBA. Whether they're still playing in China or not. On Halloween, after just 72 days of marriage, Kim Kardashian filed for divorce from Kris Humphries, who had to wait another 51 days before New Jersey re-signed him. Good thing he's a rebounding specialist, because booing Humphries -- thanks to Knicks fans who started it in a preseason game -- has cruelly become commonplace wherever the Nets go. According to the unofficial tally kept by veteran New York Times scribe Howard Beck, who was there for pretty much every hotel stakeout endured by reporters on the lockout beat, officials from the league and the union met for 184 hours over the course of 25 negotiating sessions from Aug. 1-Nov. 26, many of them contentious. After 149 days of rhetoric, squabbling and considerable in-fighting on both sides that generated plenty of pessimism around the league about the season starting at all, NBA owners and players huddled again after Thanksgiving and finally managed to reach a tentative agreement to end the lockout. Ultimately motivated more by the ability to start a 66-game season on Christmas Day than they wanted to keep pressing for an even more restrictive financial landscape, NBA commissioner David Stern and his owners signed off at last on Nov. 26 on a deal that still reduced the players' annual share of Basketball Related Income from 57 percent in the final year of the old deal to 50 percent. "This process got speeded up because we sat down with the players and we agreed that Christmas Day was a wonderful magnet," Stern said last week. "If we were going to be able to play 66 games ... [we said] let's do it this weekend or we'll see you whenever. And whenever was going to be a very contentious whenever." Seven veterans, including four former All-Stars, were released through the amnesty clause in the new collective bargaining agreement: Orlando's Gilbert Arenas, New York's Chauncey Billups, Cleveland's Baron Davis, Portland's Brandon Roy, Indiana's James Posey, New Jersey's Travis Outlaw and Golden State's Charlie Bell. Billups (Clippers), Davis (Knicks) and Outlaw (Kings) already have new teams. Six new coaches formally began their tenures when training camps opened more than two months late on Dec. 9: Mike Brown (Lakers), Kevin McHale (Rockets), Rick Adelman (Wolves), Mark Jackson (Warriors), Dwane Casey (Raptors) and Lawrence Frank (Pistons). Six days after Stern, essentially operating as the voice in charge of the league-owned Hornets, vetoed a three-team trade that would have put Chris Paul in the same Lakers backcourt alongside Kobe Bryant, New Orleans agreed to send Paul to the Los Angeles Clippers for Eric Gordon, Chris Kaman, Al-Farouq Aminu and an unprotected 2012 first-round pick that Minnesota owes the Clippers. With CP3 joining forces with reigning Rookie of the Year Blake Griffin and Billups and committing to stay with the Clips through at least 2012-13 as part of the trade, L.A.'s long-suffering other team has never been more viable. Stern, though, was criticized harder for blocking the original trade than anything he said or did during the lockout. And ultimately sending Paul to the Donald Sterling-owned Clips -- even though most observers were forced to grudgingly admit that the Hornets came away with a strong package of pieces to start the rebuilding process -- didn't improve Stern's approval rating any. After a degenerative knee condition cut his scoring almost in half last season, Brandon Roy stunningly opted for retirement on Dec. 10 instead of trying to make one more comeback in Portland. The 2007 NBA Rookie of the Year and three-time All-Star carried the Blazers to their epic comeback from 23 points down against Dallas in Game 4 of the teams' first-round series, but that'll be remembered as the last glimpse of the real Roy, who averaged just 12.2 points in 47 games last season after averaging 21.5 points per game in 2009-10. 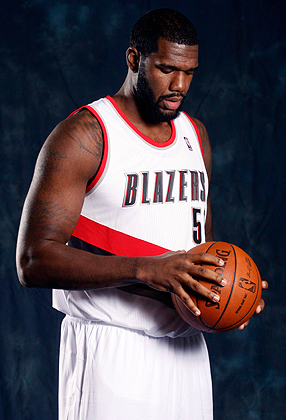 Worst of all: Roy's decision to leave the game was announced on the same day that the Blazers found out that long-tortured center Greg Oden will likely have to be shelved for another full season because of ongoing knee issues. What can you possibly say to console Blazermaniacs at this point? Scary stuff. When the Celtics announced Dec. 17 that Jeff Green would miss the entire season due to an aortic aneurysm that is expected to require heart surgery, it was merely the most extreme of four heart-related scares (or worse) for NBA players since the lockout ended. Chuck Hayes' four-year, $21.3 million contract with the Kings was voided because of heart concerns before the Kings -- after Hayes underwent a thorough battery of tests in the wake of a failed physical -- offered Hayes an extra million to re-sign with them. Portland's LaMarcus Aldridge and Toronto's Aaron Gray were also required to be monitored closely this month. The 66-game schedule contains 42 instances of teams playing back-to-back-to-back games on three successive nights. Twelve teams have to do it twice: Atlanta, Denver, Detroit, Indiana, L.A. Clippers, Minnesota, New Jersey, Philadelphia, Phoenix, Portland, San Antonio and Washington. After the lockout in 1998, 12 teams had to complete three back-to-back-to-backs during the abbreviated 50-game season. OKC's Kevin Durant will be bidding for his third successive scoring title and ranks as the first player since Michael Jordan to lead the league in scoring in two of his first four seasons. The other seven to do so are all in the Hall of Fame: Jordan, Bob McAdoo, Kareem Abdul-Jabbar, Wilt Chamberlain, Neil Johnston, George Mikan and Joe Fulks. A total of 240 games were lost thanks to the second-longest lockout in league history. Only the 1998-99 lockout, which spanned 204 days and cannibalized 464 games, was longer. LeBron is now in his ninth season ... and it's championship or bust. His Airness, of course, needed only seven seasons to win his first championship. Dwight Howard might prefer fielding questions about possible trades to talking about his Christmas Day production. After recording just 11 points in Sunday's loss in Oklahoma City, Howard has a career total of 34 points in his four Christmas appearances. In all other regular-season games, Dwight is averaging nearly 19 points and 13 boards for his career. It took just three games for the Durant/Russell Westbrook dynamic to become a matter of national debate, thanks to their sideline clash Wednesday night in Memphis. You wonder how much OKC might suffer from the lack of a true veteran in the locker room to help the young guys through their growing pains, given that all six of the Thunder's returnees who averaged at least 25 minutes per game last season -- Durant, Westbrook, James Harden, Serge Ibaka, Kendrick Perkins and Thabo Sefolosha -- are all 27 or younger. No wonder Durant was lobbying Shane Battier so hard to sign with the Thunder instead of the Heat. Only 76 days to go before the NBA trading deadline on March 15. First bold prediction for 2012: Dwight will be dealt before All-Star Weekend descends upon Orlando from Feb. 24-26. How serious is Greg Oden's latest health setback? The following disclosure is a pretty fair indication that Oden is a long way from getting back on the floor: Sources with knowledge of the deal told ESPN.com this week that the 23-year-old agreed to take his salary down all the way to $1.5 million when the parties mutually agreed to negotiate a new one-year contract earlier this month independent of Portland's original qualifying offer. If $1.5 million is a figure Oden was willing to consent to, down from the $8.9 million qualifying offer Portland extended to him before the lockout to prevent Oden from becoming an unrestricted free agent, this is sadly shaping up to be another lost season for the injury-tortured big man picked ahead of Kevin Durant in the 2007 draft. The implication is that Oden didn't have the leverage to hold out for month because the odds of him being healthy enough to get back on the floor before season's end are so slim. In his four NBA seasons to date, Oden has still played in only 82 games total, averaging 9.4 points, 7.3 rebounds and 1.43 blocks in 22.1 minutes. Oden lost his entire rookie season after being forced to undergo microfracture surgery on his right knee and missed the 2010-11 season when microfracture was then needed on his left knee. To seal his trade to the Clippers, Chris Paul opted into the final year of his current contract, thus ensuring that the Clips will have him through the 2012-13 season before CP3 can become a free agent. Yet that also means that Paul, who is currently only eligible for a one-year contract extension, becomes eligible to sign a two-year extension with the Clips starting June 14. That's not to say it'll happen that fast, but the Clips knew when the trade went through that they'd be able to start making that pitch in six months. The dream scenario in Clipperland, obviously, is signing CP3 and Blake Griffin to extensions before they ever get to free agency. One other footnote from that trade: Hornets center Chris Kaman had a 15 percent trade kicker in his contract that earned him an extra $1.6 million when the Clippers put him in the package for Paul along with Eric Gordon, Al-Farouq Aminu and Minnesota's unprotected 2012 first-round pick. Kaman is on the books this season for $12 million in the final year of his current contract, but in reality he'll be making $9,819,512 with all players losing 16 games' worth of salary thanks to the lockout. NBA commissioner David Stern continues to say that he expects the league-owned Hornets to be sold in the first half of 2012 and that the buyer will "hopefully anchor [the franchise] in New Orleans for a long time." As for the trade he ultimately made for the Hornets after canceling New Orleans' three-team deal with the Rockets and Lakers that would have made CP3 a Laker? Stern naturally believes that history will reflect well on the L.A. trade package he held out for. "I think I made a very good decision for the fans of New Orleans," Stern insists. 3. What Will Magic Want For Howard? All we know right now is that it's obviously not going to come soon enough for New Jersey Nets fans, who serenaded their team with chants of "We Want Howard" during a humbling home defeat to the Atlanta Hawks at the Prudential Center on Tuesday night. Which happened to be the Nets' home opener. There is at least a fairly clear sense out there about what the Magic would eventually want in exchange for Howard if they decide, as widely expected between now and the March 15 deadline, to make sure they get something for the face of their franchise as opposed to risking the sight of their Team USA center bolting Orlando in July with nothing coming back in return, just like a certain TNT analyst did in the Olympic summer of 1996. A picture of what the Magic will ultimately expect in a swap for their defensive anchor has indeed begun to emerge, with sources briefed on Orlando's thinking telling ESPN.com this week that the Magic do not plan to hold out for youth and draft picks as the league-owned New Orleans Hornets were ordered to do in the Chris Paul sweepstakes. The Magic, sources say, would instead prefer to bring back multiple established veterans who can keep the team competitive. Reason being: Orlando moved into a new arena last season and has an 85-year-old owner in Rich De Vos. Sources say De Vos has little interest in starting over/rebuilding, as evidenced by the recent decisions to trade for Glen "Big Baby" Davis and re-sign Jason Richardson even though Howard's future is so murky. Q: Everyone seems to think that your team's youth is a huge advantage when it comes to playing 66 games in such a short space of time. How do you see it? A: This schedule's tough, man. Sometimes you play five games in six nights or six games in seven nights. That's tough for anybody no matter how young you are. But we have a great training staff that's gonna keep our bodies right and make sure we recover right after games. Hopefully we push through it. Q: As much as we all hated the lockout, I'm guessing you'll be one of the guys who actually looks back fondly on all the stuff you were able to do. A: Oh, man. It was a great summer for me. It was a dream come true to do the things I've done, like playing in Rucker Park or going across the world to play in the Philippines and China. Of course the lockout was tough. But I did some things that I normally wouldn't do, so it was kind of cool at the same time. Q: Why was playing at Rucker Park such a big deal to you? A: It's just a legendary venue for basketball, man. People who can say they went there and played well, just to put my name in that category, made me feel really good. People might say it wasn't NBA players there or it wasn't an NBA game, but just me loving the game, Rucker Park is somewhere I always wanted to play. So to cross that off my Bucket List is pretty cool. Q: You know there will be more scrutiny on this team than ever before. What kind of impact does that have on you guys on a daily basis? A: They watched us closely last year, I think, with us coming off that first-round loss to the Lakers after we pushed them six games. People scrutinized us last year, tried to break us up as a team, but we stayed together. We fought through it. We knew that was gonna happen. And this year is going to maybe be a little worse just because we almost got to the Finals. But it's something we're all prepared for. We're all ready for it. The only thing we can control is how hard we work every day. And I know we're gonna come to work. Q: Have you rewatched much of the Dallas series? A: Nah. I couldn't, man. It was tough 'cause I know everything that went on in that series, I remember every possession, so it's tough for me to watch that. That's one of those things you just try to get out of your head and focus on your next season. Also I know what I have to do to get better from that. Q: Like shooting Dirk's one-legged stepback? I see that Kobe's shooting that shot now and you're shooting it, too. A: Worked on it all summer. First thing I worked on when I went to the gym every day [in the summer]. ... I'm a year older, so I know the game a little bit more now. I've been working on every part of my game. I'm a simple, basic player, man. You ain't gonna see a big, drastic change from me. But I think small things will grow and get better in my game. Just hopefully I have a good season. That's all I want, to have a good season individually for myself and of course for my team. Fresh off signing a five-year contract extension with the Bulls worth nearly $95 million, Derrick Rose is said to be closing in on another lucrative deal. Lucrative is seriously underselling it based on the figures dribbling in to us. One industry source insisted to ESPN.com this week that Rose's new shoe deal with adidas will easily crack nine figures and could legitimately approach the $250 million range -- as in $25 million annually over a 10-year span -- in what is known in the shoe game as a "lifetime" deal. How can the reigning MVP possibly command those kind of dollars as a shoe endorser? Here's how: Rose, as it was explained to me, is adidas' only counter to Kobe Bryant in China. I'm told Rose already outsells LeBron James there. New York Yankees mainstay Derek Jeter was spotted courtside at the Charlotte Bobcats' season opener Monday, but that's not nearly as stunning as it sounds. Jeter isn't merely a Brand Jordan spokesman. He's one of Michael Jordan's best buds and was obviously lured to a Milwaukee-at-Charlotte game in December by the Bobcats' owner. Seeing Jeter there, though, took me back to late May 2010, when there were some strong rumblings in circulation that Jordan was trying to convince Jeter to be a co-investor in the Bobcats. This was before MJ had emerged as the clear front-runner to buy the team from Bob Johnson. So strong were the rumbles that I went to a Yankees/Rangers game to ask Jeter directly. But Jeter shot it down pretty forcefully. Jeter said at the time: "I have not been asked, buddy." When pressed about whether he has any interest in following Jordan's lead into the ownership realm, Jeter added: "(For) a baseball team. I don't know much about basketball." During an appearance Thursday on ESPN Radio with Linda Cohn and Adnan Virk, Hawks center Al Horford was asked about ESPN.com's report earlier this week that Atlanta engaged Orlando in Dwight Howard trade talks this month, as well as the notion that the Magic would surely want Horford as part of any swap if the talks ever go anywhere. "Wow," Horford said. "I guess I'm heading back to Florida. ... I don't know, that's interesting, I know that Dwight is from here, but as far as I know, this is the first I've heard of it. But it'll be interesting." The surprise in Horford's voice was genuine. The gentlemanly center left the distinct impression that he was willing to play along with the line of questioning, since the interview was live, but really wasn't aware of such chatter. Yet it certainly makes sense that Horford would be a name at or near the top of the Magic's wish list, assuming Orlando reaches the point before the March 15 trade deadline that it finally decides it has to shop its free agent-to-be for the best possible deal it can find. Sources told ESPN.com that the Hawks' offer to Orlando definitely featured $124 million guard Joe Johnson. Expanding such an offer to include Horford, an All-Star in the East as well, would obviously be harder for the Hawks to digest, but Josh Smith's close friendship with Howard, as Michael Cunningham of the Atlanta Journal Constitution suggested this week, would seem to give Atlanta cause to keep Smith over Horford. Howard, remember, does not have the Hawks on his list of preferred trade destinations. Smith's presence, then, might be the Hawks' best hope of getting Howard to warm to the idea of playing for his hometown team, even when Atlanta's ownership situation remains so unsettled. Asked by Virk how closely he pays attention to trade speculation, Horford said: "You have to pay attention to [rumors], just because obviously you're concerned [about] what goes in the league, you want to see who's getting better. At the same time, like you guys are telling me now, you might be the person who's moving, so you always have to kind of be on the lookout for things that are going on." Portland's Greg Oden still hopes to play at some point during the 2011-12 schedule, but more knee complications could cost him another full season and already cost him some money. (See Box 2). "I would say to you that this is a system more likely than not that is going to be here 10 years from now." NBA commissioner David Stern, discussing the league's new 10-season labor pact, which either side -- players or owners -- can walk away from after Year 6. It's already considered a virtual lock that one unhappy side (or both) will want to opt out after the 2016-17 season, given that it took mere minutes after Lockout 2011 was lifted for Orlando and New Orleans to be engulfed by non-stop trade speculation about the inevitable departures of stars Dwight Howard and Chris Paul to bigger markets. The new labor deal, after all, is supposed to help small-market teams keep their stars and/or promote competitive balance. It is supposed to spare them from being forced into the sort of trades New Orleans just made to send Paul to the Los Angeles Clippers before potentially losing him for nothing in free agency. Didn't take long, as a result, for poor reviews of the new deal to start circulating. In the wake of the Hornets' near-trade of Paul to the Los Angeles Lakers on the very day that the owners were ratifying the deal, Mavericks owner Mark Cuban summed up the widespread dismay with that turn of events by blasting the freshly approved collective bargaining agreement's perceived shortcomings in separate radio interviews in Dallas on ESPN Radio (103.3 FM) and The Fan (105.3 FM). First Cuban insisted that an "NBA-owned team, after having gone through a lockout, [has] to give the rules a chance to work" instead of trading Paul so quickly. Then he asserted that "small-market teams [that] were drowning in 10 feet of water before are (now) drowning in two feet of water." "Some people look at that as an improvement," Cuban said. "I don't." Stern's retort -- issued on Christmas Day at a news conference in Cuban's building shortly before the Mavericks opened the defense of their title in a Finals rematch with Miami that went frighteningly awry in a hurry -- is that it's far too soon to judge the new CBA because its more stringent luxury-tax system doesn't kick in until the 2013-14 season. "We're beginning to see shorter contracts already under the collective bargaining agreement as teams cast a wary eye on two years from now, when the enhanced tax gets to be considerably higher and you have to be mindful of that," Stern said. "This is a deal that doesn't even click in to its full force until its third year. We think that's going to work, over time, to get to where we want to get to." Said Cuban in his recent interview on the "Ben and Skin Show" on ESPN Radio in Dallas, expounding on a season-saving agreement with the players that, for the record, he voted against: "One of the goals of the lockout was to say that small-market teams now have a chance to keep their players. And the rules were designed to give them that opportunity. So to all of a sudden have a league-owned team trade their best player, particularly after having gone out and sold a ton of tickets in that market, that's not the kind of signal you want to send. Then Part 2 of that is all the rules of what you can and can't do under the new CBA weren't finalized until (Dec. 8), so how do you really make a strategic decision until you know all the rules?" With New York claiming Jeremy Lin on waivers, Phoenix bringing in Michael Redd, Memphis replacing Brian Skinner with a re-signed Hamed Haddadi and Dallas signing Yi Jianlian, there will be 434 players under contract in the NBA when 2012 starts, leaving only 16 open roster spots in the league. The following chart breaks down how all 30 teams were assembled, reflecting when/how each player was first acquired by his current team. There were 88 former D-Leaguers on NBA opening-day rosters, including New Jersey's Dennis Horner, who literally paid his own way to get into a national D-League tryout camp as recently as six months ago. A handful of familiar NBA names, meanwhile, have popped up in the D-League this season, most notably Ricky Davis and Greg Ostertag -- attempting a comeback at 38 after five years in retirement -- joining the returning Antoine Walker. The latest NBA vets to enter the D-League player pool, sources told ESPN.com on Friday, are guards Mike James and Damon Jones. James has played for nine NBA teams and, after recent stints in China and Turkey, is said to be in top shape and trying to earn one more shot at the highest level at age 36. Jones, 35, is a career 39-percent shooter from 3-point range who has played for 11 NBA teams and has also been working overseas since he was last seen with the Milwaukee Bucks in 2008-09. Gerald Green and Mardy Collins, meanwhile, are former first-round picks playing in the D-League as well. But they're still too young to be lumped in with the comeback trailers. Right?